HPDA created a relaxing and comfortable environment lounge for patients awaiting discharge from hospital. Obviously, the safety of the patients entering and exiting the facility was of prime importance. It was for this reason that HDPA specified the Trailflex permeable paving system to surface the entrance ramp. 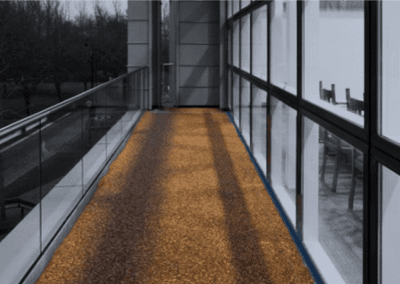 Trailflex has superb anti slip properties, making the surface ideal for those with reduced mobility. Made from a unique combination of rubber, resin and stone the surface can process more than 50,000 litres of rainwater, per meter per hour. Water drains straight through the surface back into the ground, ensuring that there is never any standing water on the surface. Trailflex is flexible to 90 degrees small finds or grit move through the surface guaranteeing continuous porosity with virtually no maintenance. As every square millimetre of Trailflex is an effective soakaway, additional surface drainage is usually not required. In most circumstances Trailflex is installed on to a pre-prepared subbase of type 3 aggregate and water percolates naturally into the ground. 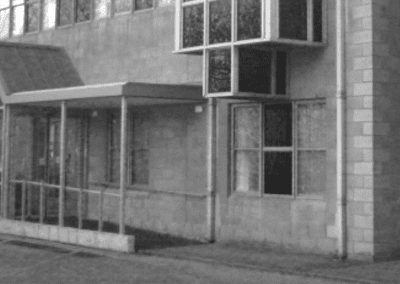 In this case the ramp had already been constructed in concrete. 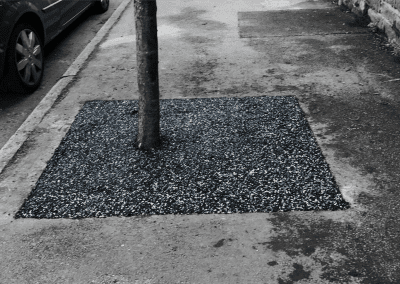 The area was primed and Trail flex was then installed directly onto the concrete to a depth of 40mm. Water now runs through the surface and is drained at the base of the ramp into a strip drain filled with Trailflex.